On a recent visit to Capaha Park, I noticed a fresh stump at the top of Cherry Hill. 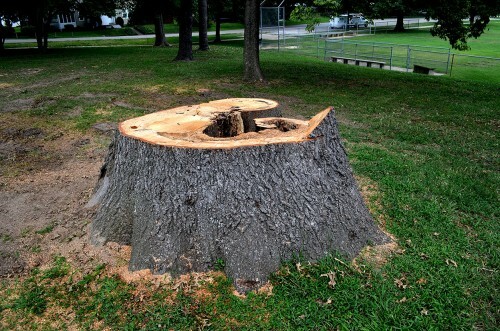 It was obvious from the hollow and rotted area that the tree must have been in bad shape, so I could understand why it was removed, but it’s still sad to see the demise of something that had been part of the park probably even before it was called The Fairgrounds. A close neighbor was also reduced to stump and sawdust. I sure hope the new plantings grow like crazy before all the old trees are gone. 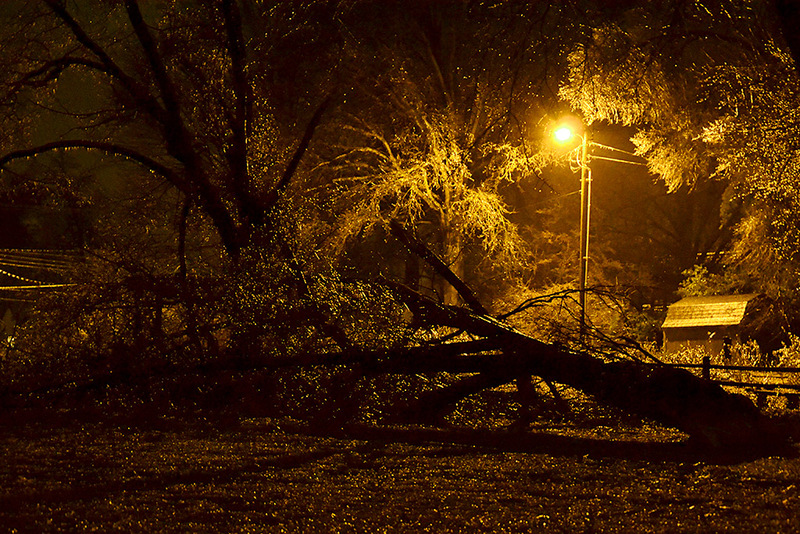 The one above might have been the tree brought down by the ice storm of 2013. That’s the Rose Garden in the background. I missed seeing in these photos any evidence of the planting of new trees. (Admittedly not much of the park is shown here, so my judgment may be too hasty.) I wonder if there’s an active replanting program in place for Capaha Park and other public places in Cape. I can not see a cut down tree without thinking of Miss Mary Z. Reed. I didn’t appreciate her love of trees when I was a Junior at Central in her English Class. I have a greater appreciation today. 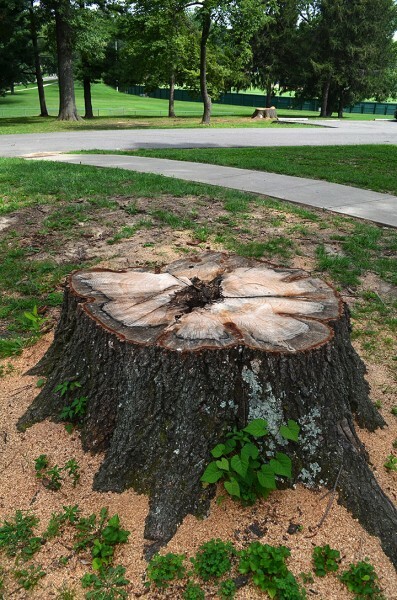 We are losing Ash Trees in our part of Saint Charles County because of the Green Ash Borer. I have at least one Ash to remove this fall when it gets cooler. I don’t know about a formal program, but there several young trees planted in the park with memorial plaques. The whole park actually looks pretty nice to walk through, if you can dodge the goose poop.